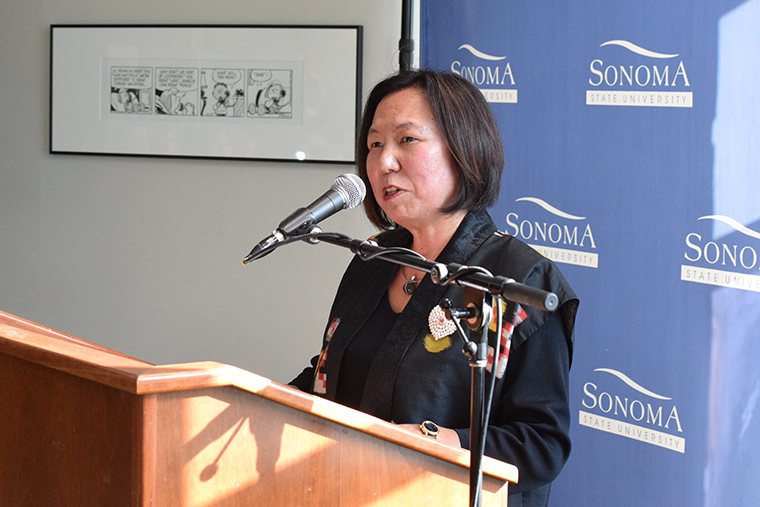 Sonoma State University President Judy K. Sakaki and others were on hand to tell personal stories at a September 13 reception for the University Library Art Gallery's exhibition, "Creativity Unconfined: Life in a World War II Japanese American Internment Camp." The reception also highlighted the University Library's Digital Special Collection on Japanese Americans of Sonoma County. Just outside the second floor gallery is a digital exhibit highlighting the Collection. Photos, letters and artifacts from Japanese Americans of Sonoma County and their wartime experiences in American incarceration camps have been digitized and added to the collection. The range of cultural heritage materials in these newly digitized collections includes interviews, photos, legal documents, yearbooks, correspondence, memos and artwork produced in the internment camps. "Part of the unique nature of these cultural heritage materials is that they offer regional stories that have in many instances been known previously only to local communities," says Lynn Prime, special collections and university archives librarian. SSU Special Collections is one of 14 campuses involved in the California State University Japanese American History Digitization Project, a multiyear effort identifying, digitizing and providing access to important Japanese-American historical materials on a central website. This California history project is funded by grants from multiple agencies, including the National Endowment for the Humanities and the National Park Service's Japanese American Confinement Sites Program. Many CSU campuses have received support from community members and local organizations such as the Japanese American Citizens League. Thanks to the Sonoma County JACL, SSU has been able to substantially increase its North Bay Ethnic Archive with letters, photos and audio interviews that reflect the war years endured by North Bay Japanese-Americans at Colorado's Camp Amache. The Sonoma State University Library Special Collections houses the North Bay Ethnic Archive, home to a wide variety of ethnic history materials including family photos from Sonoma County Japanese-American residents, unique letters between Sebastopol neighbors documenting their shared wartime experiences, incarceration camp newsletters, and War Relocation Authority documents and photographs. Photos: At top, SSU President Judy K. Sakaki speaks at a reception for the University Library Gallery's "Creativity Unconfined: Life in a World War II Japanese American Internment Camp" reception. Below, a photo from the SSU Special Collections, Leaving Granada (Amache) Incarceration Camp.